One-time Passwords are an extra layer of security to help prevent unauthorized access into your PSO2 account. Players who wish to register for this service must use the Google Authenticator app. Google Authenticator is the newest method in protecting your account with a One-Time Password. All the perks available to OTP users also apply to those who sign up through Google Authenticator. 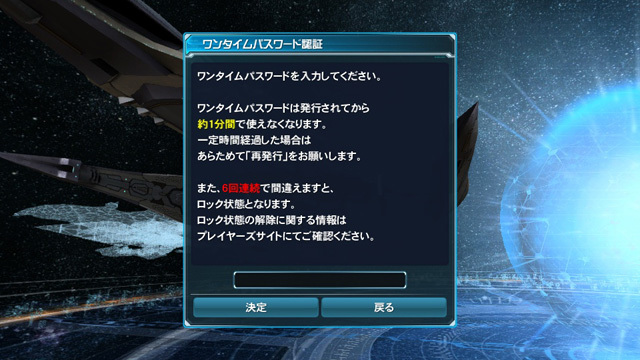 Failing to input the correct One-time Password several times will result in your PSO2 account getting locked. Having a locked account through the Google Authenticator method requires you to fill out a form to SEGA. This form is available by navigating to the SEGA Support page. Due to the above situation, it is possible to be permanently locked out of the account if SEGA refuses to offer assistance to players outside of Japan. We will append this guide with more information after players report their experiences with the support form. The following options are available to those who have lost their cellphones. Sign into the SEGA ID page, select [ ワンタイムパスワードの設定変更はこちらから]. Insert the OTP Termination Code in this box to sign on. This action will remove Google Authenticator from your account. If you do not have your OTP Termination code, then you must contact SEGA by filling out this form. What should I do if I lost my OTP termination code? The following options are available to those who have lost their OTP Termination Code. Sign into the SEGA ID page and enter your One Time Password. Follow the instructions at the bottom of this page to remove Google Authenticator from your account. Afterwards, you may proceed with signing up for Google Authenticator again to acquire a new OTP Termination Code. Why do I have an Item Trading Password If I Did Not Set It? An Item Trading Password was automatically applied for those who did not manually remove Secure OTP from their accounts. Please check the email address registered to your SEGA ID to see if an Item Trading Password was sent. Also, please take this time to remove Secure OTP from your account. Download Google Authenticator on your Android Device. Log into the SEGA ID page. Click [今回はパスワードを変更しない] to skip changing your password. Click the blue [登録情報へ] link at the top of the page. If you’re on the AC Page, click the [登録情報管理] button at the bottom of the page. Click the radio button as indicated in the screenshot and enter your birthday. Enter your birth year, two-digit month, and two-digit day. Enter your email address at the bottom of the page. Scroll down until you reach [Google認証システム 未設定]. Click the ｢ワンタイムパスワード設定｣ button to continue. In the Google Authenticator app, tap the three dots in the top right corner and select [Set up Account]. Tap [Scan a Barcode] and download the app it requests. 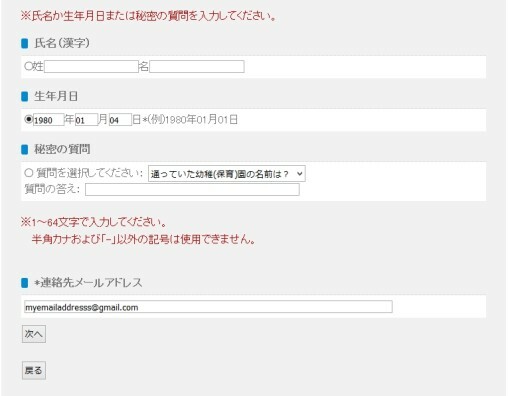 On the website, type the 6 digit code in the form beneath [確認コード]. Press [登録] to register the code. Copy the OTP Termination Code [ワンタイムパスワード解除コード] and store it in a safe location. 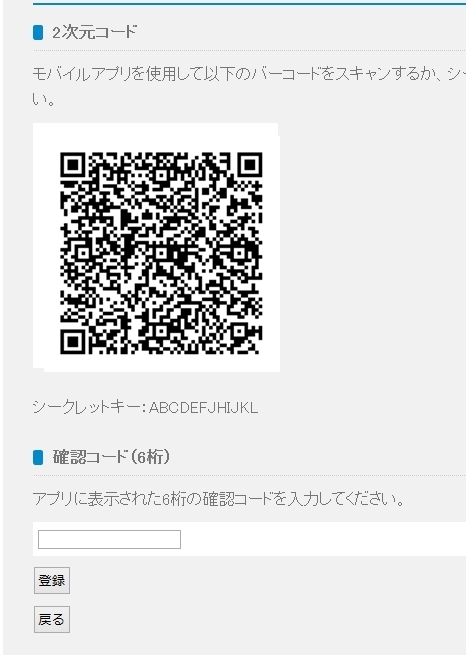 If you lose your device, you may use the termination code to access your account after you log into the SEGA ID page. ※ We strongly recommend saving this code in a secure location outside of your cellphone! !! Please Stop What You’re Doing and Save the OTP Termination Code !! !! The OTP Termination Code Must Be Stored Outside the Cellphone !! A One-time Password will be required upon signing in. Failing to input the correct password several times will result in your PSO2 account getting locked. The only way to unlock your account is to contact SEGA by filling out the SEGA Support form. Sign into the SEGA ID Management page. The second step will require a one time password. Click the 登録情報へ link at the top and enter your details. Click the [解除] button to delete the OTP. This message will appear after successfully deleting the OTP. Due to the success of the Google Authentication method, Sega has decided to terminate Secure OTP from the game servers as of September 28th, 2016. Players who failed to remove Secure OTP from their accounts will be forced to contact SEGA to prove the account is indeed theirs. Please use this form to open a ticket with Sega. The easiest to use with maximum compatibility to use would be Google Authentication. I’ve just got it set up with Google Authenticator. It was super simple, and with past experience with the Authenticator, it never stop working for me. It even works when your phone is offline. So essentially, if for some reason you get locked out of your account with Google Authenticator, for whatever reason, you can pretty much kiss your account goodbye? Since you’d have to go through Sega support to have it resolved and they pretty much give no support to people outside of Japan. I think I’ll stick with SecureOTP despite its annoying issues. I’ve been locked out before and they have always reset things within an hour of my contacting them. You could also try contacting google support. sega has already announced that any lockout from google authentication goes to them. yes, google authentication lockouts are technically perma-ban for people outside japan. another reminder that we arent legal players here. Need some help here. Came back from a hiatus, but in the meantime I forgot my OTP was on my old ipod. I believe I have logged in onto my OTP account, but I’ve locked myself out of sega. I’ve tried emailing Sega with no response and OTP is saying that my serial number doesn’t match or something. Anyone have some insight? You seem to be pretty much locked out. one last thing I could try is to reinstall OTP on that old ipod. anyone know if account numbers are directly related to the device? well if it doesn’t work at least it confirms it… so I can stop trying. you’re wrong to mail SEGA in the first place. If you still use 3rd Party networks SecureOTP app then mail the Developers instead with some detailed information on your OTP account ([email protected] ). The good thing is they accept mail in English. I mailed that email address as well and tried to give them every bit of information I had. They were still unable to unlock it or that was what I inferred from their reply in japanese. how do i change from iphone to android with this? I cant figure out how to login. Do I need to restore my account or something? I still have my iphone with otp on it but i want to get rid of it. Do you get locked out after six failed passwords EVER, or just six in a row? I wonder if Sega would accept such a nonsense address. Did you just send your ticket straight using your original IP when you did this? i kinda needed a more comprehensive guide onto this since ill be switching over to google authenticator since sega decided on their recent broadcast that they’ll be closing down secure otp on late september. Do the chances to submit your OTP code reset at some point if you input a wrong answer? The next time you input it right, of course. I seem to have encountered a problem. I’ve followed the OTP guide to the letter but can’t complete the process. Running Bluestacks I installed the SecureOTP2 app. Made an account and backed up my account information. Logged into SEGA’s One-Time Coupon page. Generated and copied over the necessary code to SecureOTP2. Completed account creation on the app. I have my serial number and can generate passcodes but I can’t find the input fields on SEGA’s site for the relevant information. The One-Time Coupon site simply brings me back to the same code. Is it under SEGA ID account management, or were the fields supposed to pop up on the One-Time Coupon page? A ha! I figured it out. The necessary text fields are supposed to appear on the One-Time Coupon page but don’t, for whatever reason. Instead, following the Google Authenticator instructions here led me straight to what I was looking for. You have to follow the guide to step 5 and click the Secure OTP option instead of Google. In case the content of the guide itself changes for any reason: You have to log-in to you SEGA ID, click [登録情報へ] at the top of the page, input your date of birth – year/month/day – and email, click ｢次へ｣, scroll down to the bottom of the proceeding page to “ワンタイムパスワード使用状況” and click the button next to Secure OTP. That’ll take you to the page where you can input your serial number and one-time password. Maybe to some that all was more obvious than it seemed, but I scoured the net and couldn’t find a single mention of that page hidden away in one’s SEGA ID account management. Everyone everywhere links back to the guide here, but SEGA seems to have disabled that half of the coupon page leaving anyone looking to use the OTP method in the lurch. Hopefully this long-winded comment helps some future PSO2 player at their wits end over what should really be a simple and straightforward process. how many times does it require for google authenticator to lock you out? My cellphone is broken and have new one what i need for get app account againd? So I just read the news from Sega that the SecureOTP service will be terminated at the end of September. Where should I go to remove my SecureOTP account? Is the following guide below regarding the removal still working now since I’ve been looking for that option in the ID management page and still didn’t see it. I found it. But do I only need to put my date of birth and email address only or do I had every single details, including the name I used and the answer of the secret questions I gave? So with the extra storage given to us recently why does anyone bother with this? Does everyone go around making simple passwords and telling other people what they are? 😛 Really the whole concept of this OTP, why it exists, etc, has always confused the heck out of me. It seems especially ridiculous since you can’t even hand off most good equipment/items to another account, and there’s no guarantee the account thief will ever be able to use the player shop on someone else’s account without the five-digit pass code. When people come forward after being locked out of their accounts/stuck dealing with technical issues, I really don’t know how to respond. Because, like, why they do dis in the first place? Bruh. If you *can’t* find gainful use for free extra 200 storage slots you’re plain doing something wrong. Also pretty sure you’re underestimating both the foolishness of people concerning passwords and the potential for sheer petty malice among the kinds of people who might try to abuse it in the first place. I’ve been using the OTP since the very first week of my pso2 experience and I’ve never ever experienced any “technical issues”. I think I recall TWICE being unable to play the game because of OTP server problems, and on both cases, SEGA gave us free stuff to make up for the hassle. There is literally no downside to having an extra 200 slot storage PLUS extra account protection, for FREE. And the only real “technical issue” one might face is in the case they end up screwing up their password 6 times IN A ROW (LOL). There’s no point whatsoever. I started not only playing but also buying unhealthy amounts of AC at least a year before OTP even existed… And I usually never payed for premium because as a noob I benefited from 500 extra slots always more then 300 from premium, better value too. Granted of course things change; but two things that never changed for me are I still buy/acquire more costumes; and have only ever occasionally sold unlucky dupe costumes from AC Scratching too much… Also to each their own, certainly no point for me to criticize… Personally though I have still to this day never given a cent of my hard earned money to gross cellular companies, and also never had a reason to own any android or igross device. More money to waste on wondrous AC dissapointment, right!? Sega already expertly maintains there networks and servers, OBVIOUSLY 12~ hour extended maintenance FTW LOL! In all seriousness though, as a network engineer and administrator myself, I don’t often like 3rd party stuff… My 2 cents as it were. Obviously people collect hundreds of items for new systems they loudly pretend to never use. Hello. I have question. I’ve finished the registering process for google authenticator and removed OTP. But what do I do with the OTP termination code mentioned in Step 7? I thought it would be needed to remove OTP once I finished setting up google authenticator, but it didn’t ask for the code. I believe you need that one for once you wanna remove google authenticator, not secureOTP. So keep that code in a save place for once that time comes. Yesterday, my phone was a mistake, so I had to reset it as factory but now the PSO2 not recognize Google Authenticator codes. When I checked the account PSO2 with Google Authenticator gave me a code if lost or stolen me my phone, I have used and also the codes work. If anyone knows how to solve this problem or possibly if someone passes through a similar situation and managed to overcome this drawback, we appreciate it. It’s been about a year since I foolishly locked myself out of the game by losing my old phone and not remembering my secureOTP serial number or username to reinstate it in my new phone and now I’m getting emails from Sega about the secureOTP service being straight up terminated at the end of september according to google translate. So, like, on a scale of 1 to 10 just exactly how screwed am I from ever being able to play this game again? Customer “SecureOTP” which has been set has terminated service at SEGA ID. now, we have to stop the log in to this SEGA ID in the management page. you as you thank you can go a stop request of “SecureOTP”. your time in the corresponding than usual Please be sure to check it as it may be. In the FAQ, there’s a template below the line that says “テンプレートここから”. You need to copy and paste the template and fill in that information when contacting SEGA with that form. It’s been a while since I’ve last played and I guess I have to remove the SecureOTP by sending a ticket to SEGA now, but I believe I’ve forgotten the address I used to register and potentially some of the other information that the template is asking for. Will it be a problem if I get some information wrong? I just don’t want to be locked out of the account because the game is playable, but it would be nice if I could use my OTP storage as well. I still have my serial number and the app for SecureOTP on my phone. Could I send an email to SecureOTP with that serial number instead? I don’t think it would look good on you to get information wrong. Since Sega has pretty much cut ties with Secure OTP, getting in contact with Sega is your only option. If I fill out the template for the ticket to SEGA and get some of the information wrong will my account still be okay? I’m not actually sure I remember all the information. Will including my serial number for SecureOTP help? Anyone got a Tutorial how to do the Google Authenticator Method? SEGA Completly changed there Webside. So i cant use the steps written here. *Right button (do not change password). *Middle top link (registration information). *Enter your birthday (and only your birthday). *Scroll to the bottom and click the button. *Enter the number that comes up into the input on the website. *Copy the release key and keep it safe in case you ever lose access to the authentication device. *Try to login as usual. *A popup will ask for the OTP. *Ask the app/program for a code (circular arrow on WinAuth). 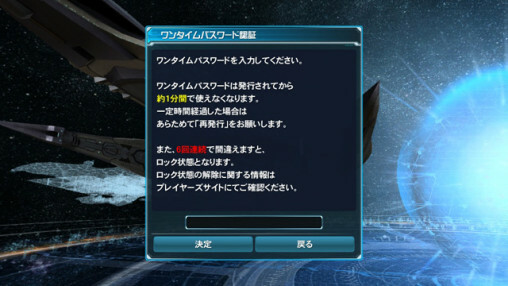 *Enter the number into PSO2. *(optional) Once logged in, go to the visiphone for campaign rewards. *You now have 200 extra spaces. 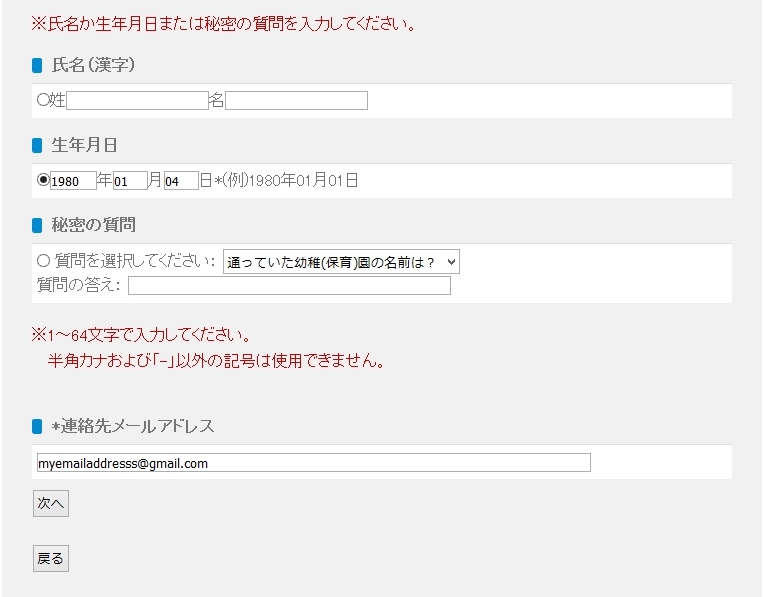 I cant get past the captcha hiragana. So.. updating these guides would help. Use Google Translate’s freehand input and stop being so helpless. If you’re getting tripped up by something as simple as a captcha you should avoid otp as you’ll probably get locked out of your account and never be able to get it back. I’m confused af, somehow I cant login back into account on SEGA id no matter if I write captcha wrong or right. Still can log into the game, not sure what happened lol. i lost my phone and the terminate code too, so i use the step and fill the inquiry, recieve mail from SEGA, but at the end its directing me to the site and still need terminate code. can someone help me…. Same to me happend last year, they cant do anything they n all infos u used, when u did register which was on season 1 on me. I am gonna start over, which is sad had 6 chara all max gear with so many stuff. I even bought so much stuff we money. But my fault in the end. I save up this time everything.